It's 3 o'clock in the evening. I was to write my "morning" diary but for curiosity i checked the Corriere news magazine and read the news. So sadness took on my mind. The legendary biologist was died. I quickly thought that under festivity there're more probability to die, I don't remember where I read it..
She was so a cultural shift for Italy and italians, that has taken a long time to build a grateful memory to her work, recognized with the Nobel prize in 1986. She was without a doubt one of the greatest Italian scientists. Her enormous value, both human and scientifical is demonstrated by every detail of her long life, that has been all spent on science and clearly fascinated all. 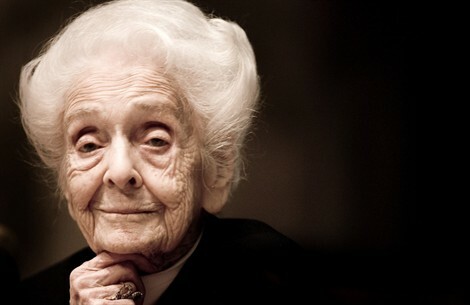 Montalcini was often opposed, sometimes, by the most conservative parts of the country, because of her open-minded. Some catholics ambients, at times, was critical against her (even my father, a careful and intelligent one, took critical stances toward her). The most controversial aspects, for such ambit, derived from ethical positions, particularly on the high value she gave to the neocortex in opposition to the limbic apparatus, that of emotions, in decision aspects. She was active in the creationism debate, as opposited to the evolution. She was member of the Pontifical Academy of Sciences. Senator for life, in politics has always been a kind of alien, continuing to work on a project for the common good, but her own way. And politicians, except for the few of higher value, have always seen her as such. Unfortunately, she is not participating in the best politic period of our republic. "Never Italy has realized that human capital it has. It is rich, but it never valued. But I am optimistic because I trust and respect the richness that our country possesses." This page contains a single entry by Luciano published on December 30, 2012 4:01 PM. Hello World (Movable Type 5 bugs) was the previous entry in this blog. Resolutions for the new year is the next entry in this blog.